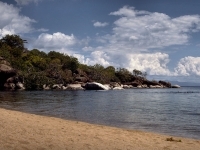 Cape Maclear (Chembe) is a small fishing village on Lake Malawi. It has one dirt road leading into town, along which there are a few hostels, some dive shops, a couple of bars and a few vendors selling curios and fruit. This unassuming tourist hub is the gateway to some of Lake Malawi's most popular upmarket lodges and camps, and therefore a very common entry point for those visiting the region. The town has an unusual layout, with the majority of the local fishermen living in the centre of the settlement. For travellers, this means that the everyday lives of rural Malawians are refreshingly on display in Cape Maclear, giving it a very authentic feel. Car rentals and bus services are available to get travellers to and from the town, although some roads are badly potholed, making 4x4 vehicles the most popular option.